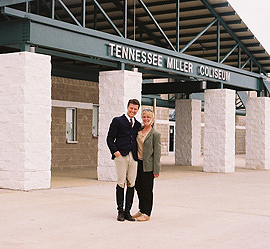 University of Vermont open level rider John Pigott & Coach Madeleine Austin had much to celebrate at the brand new Tennessee Miller Coliseum, including the sophomore's victory in individual open fences. Murfreesboro, TN - For the second year in a row, none of the undergraduate individual hunter seat participants were able to win more than one class, though the open divisions saw the same riders place in the top two, with their placings between one class and the other reversed. University of Vermont sophomore John Pigott was perhaps the most successful hunter seat rider over the weekend, placing first in individual open fences, then winning the Cacchione Cup and closing the show with a second in individual open flat. If Vermont had survived the Zone 1 Zones team competition Pigott would have likely received two more ribbons. On April 12th the Newport, RI resident had won every class he participated in at Zones (all five of them) and kept winning with open fences, the second class of the 2003 Nationals show following team intermediate fences. With the field now up to 18 riders thanks to the creation of Zone 9, Pigott had the highest score in what turned out to be a controversial class. The confusion had little to do with the riding, but rather the announcing of the results. Following each rider's turn, the combined scores of judges Carole O'Brien and Jeff Wirthman were read aloud by announcer Pat McAfee (Ken Marash had been the announcer 1998-2000 and 2002 while McAfee and Marash had shared announcing duties in 2001). The practice of reading judges' scores aloud at IHSA Nationals has not always been in place. As recently as 1997 judge's scores were read only during the Cacchione jumping and AQHA reining phases. In 2003, every jumping and reining score was read aloud, though in the early going the scores were read immediately following each rider's trip. By day two there was a "one rider delay" where listeners would have to wait for the next rider to finish his or her trip before the previous combined score would be given. It appeared as though Pigott and Savannah College of Art & Design freshman Jordan Siegel had the highest combined scores. However when the results were announced, Siegel was third while Skidmore junior Jaime Jansen was placed in the reserve category. Both head coach Cindy Ford and Jansen were taken aback, deciding as everyone else had that there was either a mistake in the announcing or in the calculation. For a short while, things remained the same. About ten minutes later, McAfee announced for the top ten from open fences to return to the ring with their ribbons as there were corrections to be made. When everyone lined up and the placings were announced a second time, Jill Humphrey of the University of California at Davis once again was tenth. Bucknell senior Whitney Scott likewise remained ninth. It turned out that seventh and eighth had been juxtaposed. Kate Fournel, a senior at Goucher College who could claim to be the only undergraduate individual from Zone 4, Region 1 to advance to Nationals (save for the Cacchione competition) had to swap her seventh for an eighth, while Oklahoma State's Audrey Buck, yet another senior, moved as close to a green ribbon as one can get. Sixth had been Texas A & M junior Meredith Houx, but suddenly the honor belonged to Jansen, who handled the whole thing well, almost assuming there had been a mistake from the get-go. Fifth remained in the hands of Boston University freshman Jessica Long, while fourth still belonged to another freshman, Erika Jewell of Virginia Intermont. Making out the best was Houx, who moved from sixth to third. Siegel, from Flower Mound, TX moved up to reserve where she seemed to belong all along. Pigott (whose winning streak may have dated back to the final Zone 1, Region 2 regular season show when he overtook Ellen Lampman of Colby-Sawyer College for the right to represent the region at Nationals in the Cacchione Cup class) kept the blue ribbon. Ten of the eighteen who participated in open fences, including eight of the top ten finishers, would ride a short time later in the Cacchione Cup flat phases. One of the eighteen participants who was done for the year was University of Florida's Amy Uniss. Mistakenly listed in the program as Anne Uniss, the junior from Denver, CO was perhaps the oldest rider in IHSA history to ride at Nationals in an open section. At 37 years of age, Uniss is older than any of the hunter seat alumni who reached 2003 Nationals and well over half the coaches of teams with riders in attendence. Her efforts during the regular season helped Florida come from behind in Zone 5, Region 3 to overtake Savannah College of Art & Design for the region championship. But alas, the gators were the odd team out at Zone 5 Zones. Pardon our bias but after the season Uniss and Florida had all we can say is hooray for you, Amy! Knock 'em dead in 2003-04! As dinnertime approached on day one of the three-day Nationals show, the individual novice flat got underway. Only a third of the riders in the class came from teams who were also participating in the hunter seat team competition, and only three of those would make the top ten. Thus the proudest moment of the year for several schools came during this division. Karin Corbett of Mount Holyoke secured tenth, while the only representative from the University of Tennessee at Knoxville was ninth. Senior Joy Warren was the lone Volunteer to reach Nationals as a participant, though many riders from throughout Zone 5, Region 1 and the other regions of Zone 5 were vital in running the show. Gillian Pech of Cornell was eighth in the first of her two rides at IHSA Nationals, but would improve on the placing two days later. Findlay senior Coagi Maten, who had won the team intermediate flat only a few hours earlier, was only seventh in her final IHSA undergraduate ride. Erina Malarkey of Skidmore, second in the team novice flat a year ago, earned a sixth this time. 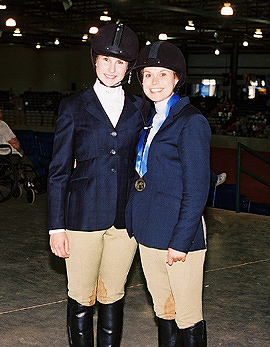 Kutztown University's Chrystal Coffelt, one of a handful of riders to compete both english and western at 2003 Nationals earned a fifth while North Carolina State freshman Rebecca Effron placed fourth. Fresno State senior Amanda Smith not only improved upon her tenth in individual walk-trot-canter at 2002 Nationals her third place ribbon here was the best ribbon of the entire show for coach Megan McGee and the bulldogs. Yet another senior, in this case Sarah Casey of the University of Wisconsin at Madison made the top ten. Casey, who would ride in team novice fences the next day with some success was reserve while sophomore Holly Justman of Western Michigan, the lone bronco rider to reach Zone 6 Zones let alone Nationals won the class. Justman had placed second to Maten at Zones but bested the oiler known for winning team classes here. At all IHSA Nationals shows the over fences divisions are in the ring first every morning, with the idea that after three jumping classes the jumps can be removed for the rest of the day. Fans who stayed from 8:23AM (when Jenn Santorello of Fairfield entered the ring to partake in the team novice fences) through 10:09PM (when Megan Palmer of Miami University of Ohio was announced as first in team open fences) got to see the jumps assembled once again, though only so that they could sit overnight and be in place for the alumni fences at daybreak on Sunday. The second of three fences classes to take place on Saturday was individual intermediate, and once again few of the representatives came from teams with an entire squad in the team competition. Fairfield had a full team on hand, and sophomore Kristen George got a nice round from her teammates following a tenth here. Lisa Capell of Centenary could say the same thing, and her cyclone teammates were cheering her ninth. Andrea Hanson, a junior at Texas A & M could not claim a full hunter seat team in the stands but did have plenty of stock seat teammates and a few more individual qualifying teammates than most to give her a round of applause. Kristen Cleary of Wisconsin at Madison was seventh (yes the badger hunter seat team was nearby, as Casey had placed fourth in the team class before and Shannon Opel was about to jump in the Cacchione immediately after). Indiana University and Purdue University have a sort of "second campus" in Indianapolis that contains the names of both schools and the city known for its' speedway. Indiana University - Purdue University at Indianapolis's Bradley Wolkoff is the third jaguar rider in three years to reach Nationals, and the first to qualify in a division other than walk-trot-canter. Wolkoff was sixth, while Elizabeth Dotts of the University of the South was fifth (with an entire sewanee team nearby. Come to think of it, many non-riding sewanees made the two-hour drive to help out or to watch). Michigan State sophomore Samantha Snyder, one of eleven hunter seat riders from Zone 6, Region 3 to qualify on an individual basis, was third. Amy Humble of Berry College, who was fourth in both intermediate team classes in 2002, was reserve champion of individual intermediate jumping this season. This time coach Ford and the throughbreds knew they really won. Lisa Hilberg had the best score, and no announcing or computing snafu changed the outcome! Hilberg also broke the Skidmore string of individual sixth place ribbons with a first, making the school from Saratoga Springs, NY the only one with individual points in each of three divisions held thus far. Skidmore head coach Cindy Ford (third from right) holds the Professional Horseman Association Trophy awarded to junior Lisa Hilberg (on horse) following her win in individual intermediate over fences. Hilberg was one of four Skidmore riders to place sixth or higher during the individual classes. Six classes were held between the intermediate over fences and intermediate flat, with over seven hours time elapsed inbetween. Eight of the eighteen riders came from schools with a full hunter seat team in attendence, while Skidmore did not have a rider in a division for the first time. Tenth went to Chelsea Macaluso of Purdue while ninth went to Renae Beggs of Cal Poly - San Luis Obispo, one of seven undergraduate riders from Zone 8, Region 1 to reach Nationals on an individual basis. Eighth went to Erika Bender of Findlay, one of six oilers to reach the individual divisions. Tarah Watson of Saint Lawrence was seventh, while Benders' teammate Amanda Blue was sixth. Sarah Kichler of Delaware Valley College was fifth, a slight drop from fourth in the individual intermedate fences at 2002 Nationals. The rider who placed fourth could claim to have placed second at 2000 IHSA Nationals as a freshman in the team intermediate flat. However Hollins senior Tara Kelly could not reach Nationals on an individual basis until this season, surprisingly in the intermediate flat! Kristen Dickerson of Oklahoma State was third, while Tim Leuzarder of Centenary College was reserve. Some have argued for years that Zone 2 is the strongest zone in the IHSA. By the end of the show, at least one individual rider from Zone 2 in each of the eight divisions would make the top six. This time it was Leuzarder's turn. Wheaton College made their strongest run ever at second place overall in Zone 1, Region 4. The Eastern Massachusetts school may not have been able to claim that spot but they can claim the best intermediate flat rider in the country this season, as freshman Marie Stewart won the division. Only two classes later was the individual walk-trot. Thirteen schools which did not have a full hunter seat team in attendence were represented in this section. Often thought to be the hardest class to predict, as many of the riders have only been riding a short period of time, the champions of the division over the past five seasons show that the better programs around the IHSA usually produce the winner here. Perhaps this shows that the better programs can make a good rider out of a beginner in the shortest period of time (Since 1998 the winner of this class has come from a team that was no worse than third overall in their region). Though the entries this season were not necessarily from the top team, all but three were from teams that finished third or higher in their respective regions. The most historic of the qualifiers was Elizabeth McLemore of the University of Montana, who became the first hunter seat rider from a school in the current Zone 8, Region 3 other than College of Southern Idaho to advance to Nationals. The light blue ribbon for tenth went to University of South Carolina senior Michelle Jenkins while the dark blue ribbon for ninth was awarded to Natalie Freeman of the University of California at San Diego. Emily Maurer of Wisconsin at River Falls received a brown ribbon, while the purple went to Ohio University's Rachel Vanderberg, the only rider back at Nationals from the defending hunter seat National Champion bobcats. The green ribbon went to Linda Nguyen of Cornell, marking the first year ever that the big red advanced two undergraduate riders to Nationals. Though they had more riders at Nationals this season than region rival Mount Holyoke, James West of the University of Massachusetts at Amherst was the only rider from the minutemen to pin above the participation level, with a fifth. Amanda Coody of Hollins was fourth while Centenary junior Elizabeth Mower was third. Reserve went to the only Saint Andrews' Presbyterian College rider at this season's show, in the person of senior Heather Grindell. Many of late have argued that Zone 1 is now the strongest zone, in part due to some great open riders throughout New England. While Zone 2 certainly held it's own in the individual competition, it should be noted that when Brown sophomore Galyn Burke won the walk-trot, she became the third rider from the zone to win an individual class at 2003 Nationals (and all from different regions!). Riders from Zone 1 did make the top ten (if only barely on two occasions) in each of the eight individual sections. And the top hunter seat team this season is from slightly south of Boston. Burke, who is from Northern California but rides for Brown in New England, had a very good day, as she had placed second in the team walk-trot-canter four classes earlier. Individual novice fences was the second class of day three, and no rider from Zones 1 or 2 would place first in an individual class all day. Erin Jackson of Penn State (who had been the first rider in the ring to start the entire three-day show on Friday) was tenth in novice fences while Erin Fletcher, the only Stonehill rider to reach Nationals on an individual basis, was ninth. Fletcher did ride twice, having competed in individual novice flat on Friday. Fresno State junior Amanda Hancock placed eighth while Rutgers Freshman Erica Bello was seventh. Katie Franklin of Findlay was sixth, the fifth oiler out of seven entrees to make the top ten in an individual class. Lesley Maradik was the second of three Purdue boilermakers to reach nationals individually in the hunter seat, and her go over fences would result in a fifth. Connecticut College freshman Nikki Hayes was fourth, earning perhaps the best ribbon to date for a camel Nationals participant. Anne Elizabeth Thornlow of Hollins was third while Pech of Cornell had the better of her two performances, earning reserve honors here. The Oklahoma State media guide lists Lindsey Smith as a marketing major from Mountain Home, Arkansas. The guide goes on to say that Smith's interests include rock climbing, water sports and repelling, not to mention horseback riding. No doubt the media guide for next season will add something about Smith placing first at 2003 IHSA Nationals in the individual novice over fences. Smith, like each of the other seven riders to win individual hunter seat classes, was rewarded with a Collegiate Saddle for her effort. The individual walk-trot-canter took place four classes later. Charmian Cooper of Lehigh became the first mountain hawk to earn a ribbon at Nationals since they were the engineers (Lehigh switched official nicknames in the late '90's. Jeff Ayers placed in the individual open flat during '79 Nationals in Murfreesboro but we at Campus Equestrian are still trying to confirm if any Lehigh rider scored on the board during a 1980's Nationals). Pronounced Shar-mee-ann, Cooper was tenth while Diana Rosenbaum earned the best Mount Holyoke ribbon of the show with a ninth. Though the University of Georgia's Rebecca McNorrill only received a participation ribbon, teammate Elizabeth Newsome picked up an eighth head-to-head in the division, as both had survived Zone 5 Zones in the walk-trot-canter. Ann Gerin of Lake Erie College, one of only two undergraduate hunter seat riders from Zone 6, Region 1 (plus their Cacchione representative), was seventh. Leah Dissek was the final Findlay rider of the show to earn a ribbon, placing sixth here. Findlay went on to be reserve champions in the hunter seat team competition, though all team classes were complete at this point. Sarah Klingler became the first rider from Allegheny College in Pennsylvania to reach Nationals in the three year history of the team, placing fifth. Klingler was one of three riders from Zone 3 to place fifth on an individual basis (Kichler of Delaware Valley and Coffelt of Kutztown were the others). Jessica Jenson of Wisconsin at Madison was fourth, the sophomore earning the second best individual hunter seat ribbon for the new Zone 9 in the process. Alyssa Garvin of Skidmore was third while Colorado State sophomore Hannah Gore was reserve, providing the rams with their best hunter seat ribbon of the entire show. Kelly Taylor of Cal Poly-Pomona had ended the entire 2002 IHSA National show with a first in individual open flat. While Pomona did not have a rider in that division this season, sophomore Coleen Thorndyke sent coach Jerry Liberatore out on a high note, as the Pomona rider won the walk-trot-canter. Liberatore, though still to be involved with the equine program at Cal Poly-Pomona next season, is stepping down as Equestrian Team Coach, Region President and Zone President to be a full-time Paramedic. Liberatore nearly saw his final western rider duplicate Thorndyke's feat moments later, as Mallory Salcedo placed second in individual beginner western horsemanship! Can I pose with you for good luck? Katherine McComas of the University of California at San Diego (on left) poses with individual walk-trot-canter champion Coleen Thorndyke of Cal Poly - Pomona. The Sunday line-up started at 8:09AM. With ten classes out of the way only the individual open flat remained as 5PM approached. Over and done with at 5:49PM, the final class of 2003 Nationals ended a lot like the second class had done on Friday, with Pigott and Siegel doing the best. Houx, Humphrey and Nicolle "Nicky" Meyer of the University of Michigan were also repeaters from the open fences, though Houx missed out on a ribbon above the participation level this time. Whitney Slauson of Saint Lawrence was tenth, while Jaclyn Cradduck, the only hunter seat rider from host Middle Tennessee State to survive Zone 5 Zones was ninth. Carleton College freshman Lauren Flexon was eighth, becoming the seventh rider from brand-new Zone 9 to place tenth or higher in the hunter seat individual classes. 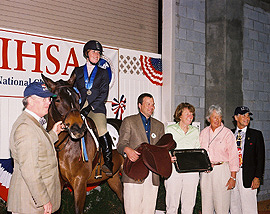 Humphrey was seventh, three places higher than her over fences but three places lower than her Cacchione Cup ribbon (Humphrey was also the recipient of a participation ribbon in individual open western horsemanship, not to mention winner of the IHSA's 2003 Versatility Award, given to the rider who competes in at least three individual classes, with at least one in both english and western disiplines). The Lindsey Phoebus era at Penn State came to an end with the senior from Lafayette, NJ placing sixth. Phoebus finally reached the Cacchione Cup competition this season, becoming the first non-freshman at Penn State to compete for the prestigious cup since 1996. One freshman who definitely lived up to her billing this season was Megan Palmer. The Miami University of Ohio newcommer from Lake Bluff, IL was a hit at three invitationals during the regular season; Champion of the team open flat on day two of Nationals, second in the Cacchione Cup completed earlier today and fifth in individual open flat this time. One rider who beat Palmer at least once at Zone 6 Zones was Meyer, who edged her this time by placing fourth. Until this point, one of the most productive riders at 2002 Nationals had not been heard from. Cazenovia junior Missy Starr, who had four rides at last year's show was third in her only appearance at Nationals this season. Pigott's long streak of blue ribbons (including the 2003 Cacchione Cup championship earlier in the day) came to a halt with a second. Siegal ended a terrific freshman season with a first. If Savannah College of Art & Design head coach Courtney Petersen and program director Andrew Lustig can bring in a few more riders like her, the SCAD bees may have a full team at Nationals somewhere along the line during the Siegal era. Individual open equitation over fences: 1. John Pigott, University of Vermont. 2. Jordan Siegel, Savannah College of Art & Design. 3. Meredith Houx, Texas A & M University. 4. Erika Jewell, Virginia Intermont College. 5. Jessica Long, Boston University. 6. Jaime Jansen, Skidmore College. 7. Audrey Buck, Oklahoma State University. 8. Kate Fournel, Goucher College. 9. Whitney Scott, Bucknell University. 10. Jill Humphrey, University of California at Davis. Individual novice equitation on the flat: 1. Holly Justman, Western Michigan University. 2. Sarah Casey, University of Wisconsin at Madison. 3. Amanda Smith, Fresno State. 4. Rebecca Effron, North Carolina State University. 5. Chrystal Coffelt, Kutztown University. 6. Erina Malarkey, Skidmore College. 7. Coagi Maten, University of Findlay. 8. Gillian Pech, Cornell University. 9. Joy Warren, University of Tennessee at Knoxville. 10. Karin Corbett, Mount Holyoke College. Individual intermediate equitation over fences: 1. Lisa Hilberg, Skidmore College. 2. Amy Humble, Berry College. 3. Jessica Willis, Smith College. 4. Samantha Snyder, Michigan State University. 5. Elizabeth Dotts, University of the South. 6. Bradley Wolkoff, Indiana University - Purdue University at Indianapolis. 7. Kristen Cleary, University of Wisconsin at Madison. 8. Andrea Hanson, Texas A & M University. 9. Lisa Capell, Centenary College. 10. Kristen George, Fairfield University. Individual intermediate equitation on the flat: 1. Marie Stewart, Wheaton College. 2. Tim Leuzarder, Centenary College. 3. Kristin Dickerson, Oklahoma State University. 4. Tara Kelly, Hollins University. 5. Sarah Kichler, Delaware Valley College. 6. Amanda Blue, University of Findlay. 7. Tarah Watson, Saint Lawrence University. 8. Erika Bender, University of Findlay. 9. Renae Beggs, Cal Poly - San Luis Obispo. 10. Chelsea Macaluso, Purdue University. Individual walk-trot equitation: 1. Galyn Burke, Brown University. 2. Heather Grindell, Saint Andrew's Presbyterian College. 3. Elizabeth Mower, Centenary College. 4. Amanda Coody, Hollins University. 5. James West, University of Massachusetts at Amherst. 6. Linda Nguyen, Cornell University. 7. Rachel Vanderberg, Ohio University. 8. Emily Maurer, University of Wisconsin at River Falls. 9. Natalie Freeman, University of California at San Diego. 10. Michelle Jenkins, University of South Carolina. Individual novice equitation over fences: 1. Lindsey Smith, Oklahoma State University. 2. Gillian Pech, Cornell University. 3. Anne Elizabeth Thornlow, Hollins University. 4. Nikki Hayes, Connecticut College. 5. Lesley Maradik, Purdue University. 6. Katie Franklin, University of Findlay. 7. Erica Bello, Rutgers University. 8. Amanda Hancock, Fresno State. 9. Erin Fletcher, Stonehill College. 10. Erin Jackson, Penn State University (State College). Individual walk-trot-canter equitation: 1. Coleen Thorndyke, Cal Poly - Pomona. 2. Hannah Gore, Colorado State University. 3. Alyssa Garvin, Skidmore College. 4. Jessica Jensen, University of Wisconsin at Madison. 5. Sarah Klingler, Allegheny College. 6. Leah Dissek, University of Findlay. 7. Ann Gerin, Lake Erie College. 8. Elizabeth Newsome, University of Georgia. 9. Diana Rosenbaum, Mount Holyoke College. 10. Charmian Cooper, Lehigh University. Individual open equitation on the flat: 1. Jordan Siegel, Savannah College of Art & Design. 2. John Pigott, University of Vermont. 3. Missy Starr, Cazenovia College. 4. Nicky Meyer, University of Michigan. 5. Megan Palmer, Miami University of Ohio. 6. Lindsey Phoebus, Penn State University (State College). 7. Jill Humphrey, University of California at Davis. 8. Lauren Flexon, Carleton College. 9. Jaclyn Cradduck, Middle Tennessee State University. 10. Whitney Slauson, Saint Lawrence University.